​1) Question: My horse lays his ears back and acts like he's going to bite another horse. He does it while we're just standing and even while we're moving. What do I do?Answer: Your horse has too much time to think about other horses. The solution is to pick up the rein and get moving. Speed them up, slow them down. Changing their speed a lot gets their mind back on you rather than getting into trouble. Here are five quick horse-training tips guaranteed to improve your riding. ​2) Are you trying to ride an uppity horse through a two-handed exercise and you just can't seem to get the horse's head into position? Try applying pressure to just one rein (the inside rein) and offset the horse's head to the side. Then slowly add pressure to the second rein to bring the head down. The "inside rein" is simply the first rein you would naturally pick up to do the maneuver. 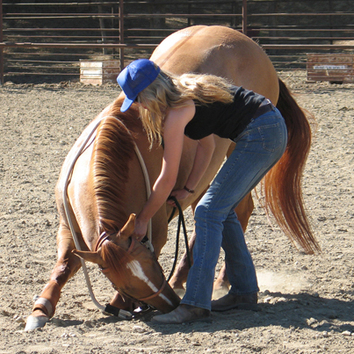 It's the same for a horse you feel might rear: Pulling the rein off to the side causes the horse to feel a lot less pressure, encouraging him to bend his neck and give. Pulling straight back, against his entire "lined-up" skeletal structure, is just asking for trouble with a horse that isn't trained to give. Pulling straight back in such a situation only encourages him to thrust his head forward and to perhaps rear. You may need to begin by picking up that inside rein and releasing when you get any kind of softening, repeating this over and over till the horse has become more obliging. 3) Owning a horse is like being married. Your horse is loaded with emotions and, like both husband and wife, it has good days and bad days. Some days you look in the stall and you just know you shouldn't go in. Other days are just great. The point here is that once you get your horse trained, it's not over. It's a constant thing to keep a healthy relationship, to keep them trained and tuned up. You'll best achieve this by being consistent in all facets of your training. 4) Horses require motivation during training - it's what keeps them trying to find the right answer. Maybe you're trying to teach the horse to move his shoulder. You pick up a rein, the pressure on the horse's mouth causes him to search for the release. He soon learns to move his shoulder ​over to get a release.) Something important to keep in mind is this: While some horses require a lot of motivation (read: pressure in your hand or legs), others may require very, very little. Assuming that all horses require a lot of motivation is asking for trouble. You've got to experiment to find out which horse you've got at the moment you're riding. "Over-motivating" an uppity horse will put too much energy into your horse; you'll have less control and he'll actually be less responsive. So, bottom line: How much motivation you apply depends upon the horse and it may take more - or less - than you first imagine. Experiment to find out what gets the best results. 5) If you're nervous about getting on your horse... don't get on your horse. Use your time to do ground work until you're comfortable getting on. Disengage the hindquarters, move his shoulders, back him up, have him change directions, etc. Do it with a lunge line or put the bridle on and move him about as if you were riding. Lots of going and stopping. Use your imagination and mock the movements you'll make later from his back. Make sure to give him a "mini-break" in between each request. Teach your horse back the easy way: Click here to "Get Your Back Up" plan.